You may remember that the original BBQ Guru Competitor had a "Good Neighbor Feature" which allowed you to disable the alarm so as not to disturb your neighbors. This feature is implemented on the NanoQ by virtue of the fact that it has no beeper! Whether or not you liked the Audible Blower feature (the alarm sounded when the blower is actually running) on the original Competitor, it has disappeared on all subsequent models, including the NanoQ. Instead, blower operation is indicated by the red LED as described earlier. Hooray! The NanoQ has an internal memory which retains all settings during a power loss. When power is returned to the unit, it will continue to operate as it did before the power loss, with the target temperature and settings retained. What is Ramp Mode? It doesn't really matter since the NanoQ doesn't have it. However, more advanced models have a clever mode in which the controller will lower the cooker temperature once the meat gets close to being done. As the meat temperature rises closer and closer to the target temperature, the controller continues to lower the cooker temperature. Ultimately, when the meat temperature reaches the target temperature, the cooker will also be at the meat target temperature. As a result, you can hold your meat at your target temperature as long as the cooker has fuel left to burn. But like we said, the NanoQ doesn't have it. To implement Ramp Mode, you need to monitor both the food temperature and the cooker temperature. 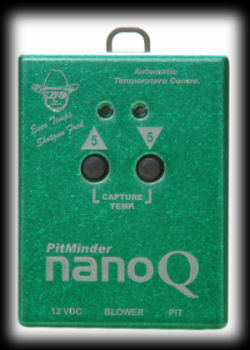 The NanoQ allows you to enter a pit setpoint down to a temperature of 50 degrees. Therefore, there is no need for the foil-wrapped-probe-in-ramp-mode trick that you could use on the original Competitor to get it to control the cooker at temperatures below 175 degrees. Just remember, though, that in order for the NanoQ to control the cooker at lower temperatures a good seal on your cooker is very important. Too much ambient airflow will prevent the NanoQ from keeping the fire low enough to maintain a low temperature. The NanoQ has a feature called "Adaptive Control", first introduced with the DigiQ II controller. The BBQ Guru describes it as: "All new full-time adaptive control algorithm learns your pit to control better stability/accuracy." If we understood Shotgun Fred correctly, over time, the unit learns how much effect the blower has so that it can more accurately and intelligently decide how long to run the blower when it needs to adjust or maintain the cooker's temperature. So for example, if the unit signals the blower to operate at 30% and it sees that the temperature overshoots a bit, it will gradually learn to run the blower at 20% instead. This "learning" is done on every use of the NanoQ II and it does not get "remembered" from one use to the other. If you turn the unit off, it will start the learning cycle over again. This is goodness, obviously, as you might wish to use the unit on different cookers, and of course, circumstances can change from cook to cook. The "learning" process can take up to an hour depending on different factors. Suffice it to say that if you are using the NanoQ on a long term cook, the unit works well initially and improves its control over time. Once again, we'll point out that your average kitchen oven will vary up to 50 degrees or more, so there's no reason to sweat over a few degrees. The NanoQ will do the job. The NanoQ of course also includes the Open Lid Detect feature that was introduced in the DigiQ II controller. People have been proposing solutions for the problem of controllers operating the blower when you open the lid on various forums. Most of the solutions involve either a tilting mercury switch or some sort of mechanical switch to detect that the lid is open. The DigiQ II solved the problem algorithmically with no additional hardware, and so here it is carried on into the NanoQ. So, why have Open Lid Detect? With the older Competitor or ProCom4, when you opened the lid of the cooker, the temperature dropped and the blower started blowing non-stop. Ash might start blowing around the cooker and of course, the charcoal started burning hotter and hotter. By time you closed the lid, the temperature would be climbing and you would end up with a cooker that was a lot hotter than you intended. You quickly learned to disconnect the blower or close the damper before you opened the cooker, and after you closed the lid you waited until the cooker had nearly recovered its temperature before you allowed the blower to do its thing again. Those days were gone when the DigiQ II was released and we are pleased to say those days are still gone. Open Lid Detect works essentially by detecting sharp temperature changes and refrains from operating the blower during these changes. So if the temperature is rapidly dropping or if the temperature is rapidly rising, the blower will not operate. The rapid drop detection obviously helps the NanoQ detect the lid opening. The rapid rise detection helps the NanoQ detect the lid closing and prevents the blower from operating when it doesn't need to assist the return to the target pit temp. The only caveat you need to be aware of is that if you leave the lid open for a long period of time, the temperature of the cooker may stabilize at a low temperature. The NanoQ will sense that the temperature has stabilized and will then operate the blower again. So you don't want to leave the lid open forever. Open the lid, get your business done, and then close it. One curiosity that we think we noticed about Open Lid Detect is that if you don't have the probe plugged in when you turn the unit on, it will sense a very high temperature. When you plug the probe in, it will now sense a low temperature. So, it will think the temperature just dropped rapidly. Sort of like when you open the lid? If you do this, you may find that the unit doesn't operate the blower for some period of time until it figures that the temperature has stabilized and it needs to start blowing to get the temperature up to the target cooker temperature that you have set. One other benefit of using this feature is to prevent overshoot when you initially heat up the cooker. If your fire is large and having the blower on full-time is causing the cooker to heat up rapidly, Open Lid Detect will detect this rapid rise in temperature and start to cut back on the use of the blower. This will allow the temperature to rise in a more controlled manner and thus cut back on overshoot. With Open Lid Detect enabled, the cooker recovered back to the stable temperature after about 8 minutes with only a 7 degree overshoot. With Open Lid Detect disabled, the overshoot was a whopping 73 degrees and it took 25 minutes for the cooker to return to the original temperature.